Hello all and Merry Christmas. I am breaking my silence this week to give you a glimpse into our first Christmas tree as a married couple. This tree sets the tone for all future trees so I have been laying the ground work with Lauren for quite a while. It would be 6 to 8 feet tall, very very full, symmetrical from all angles and have an intoxicating pine aroma. Regardless of the time required to find this magical gem it wouldn’t matter. Hours, days, weeks, whatever it takes….the time couldn’t be used more wisely. Had I not done this ground work…Lauren would have picked up the cheapest thing should could find. We probably would have ended up with a fake fern from Ikea. And that obviously wouldn’t cut it for our first tree. As usual, I may have missed one small, very tiny, detail during my tree brain storming. …we don’t live in the US. 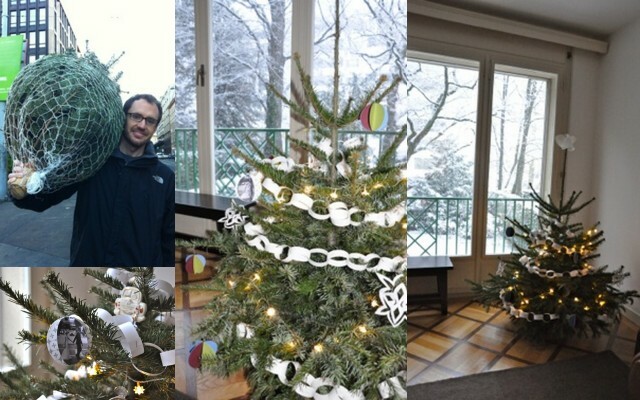 In the US I would have proposed we buy a permit and head into the mountains to fell our own Christmas tree. Unfortunately, it doesn’t work that way in Geneva. At least not that we are aware of. So instead, we did what every other Genevese (person in Geneva) does. We headed to the local grocery store to pick one up. And these babies are carry out….literally. Take a look at our beautiful 3 feet 6 inch tree in its full grandure. As usual, everything in Geneva is expensive so we opted for the smaller set of lights. Unfortunately that strand was so short they only made it around the tree twice. We had one ornament in Geneva to add to the tree thanks to Lauren’s Aunt J but we obviously needed more than that. So we spent two Saturdays ago making our own ornaments also. It may not be 6-8 feet tall, very very full, symmetrical from all angles and a bouquet of pine but I think it is a beauty. I am very proud of our first tree and think it is the perfect start to the many tree’s to come. This entry was posted in Cultural Differences, Holidays & Traditions, Life in Geneva, Life in our flat, Winter. Bookmark the permalink. Your tree is beautiful because you both took part in making it~love it! Ryan really got a kick out of reading this post by the way….miss you guys! Love reading your blog and sharing with your aunt Annette! I’m one of her good friends in Pa. Hope she gets more computer literate soon! Glad you are enjoying your beautiful adventure! Adorable ornament! Cute tree. Your mom gave me the idea for a kitchen tree and I made white paper snowflakes to decorate it. Paper snowflakes are great because they take no storage room and are beautiful as well.